With over 50 years’ experience in document scanning, one of the many industries that we serve is the finance sector. Assisting financial organisations of all kinds and sizes, we have helped businesses turn away from cumbersome and time consuming filing systems, and have paved the way for modernisation throughout the sector. Microform is one of the most trusted scanning companies in the UK, used by some of the largest and well-known financial institutions. With years of experience, we have in place some of the most controlled and secure facilities in the industry. What’s more, we constantly invest in the latest scanning technology to ensure that we remain one of the strongest and reputable scanning companies in the UK. Efficient document management is crucial for financial organisations, especially when you consider strict laws and regulations. With the scanning of financial documents and their placing within an electronic filing system, great amounts efficiency can be improved. Some of the largest financial organisations that we have worked with have reported that they have saved thousands of hours in file retrieval times. As our document management systems are bespoke to the needs of every client, we can ensure that every single document can be accessed within moments – even in some of the largest filing systems. We appreciate how important security is for any organisation, especially when that business happens to be in the financial sector. It is for this reason that our document management systems are supported by some of the best and latest security systems — ensuring the safety and integrity of every single file. To enhance things further, we can also set the system so that it can only be accessed from a single IP address so that no one outside a particular building will ever be able to connect to it. We can also arrange profile and password settings to ensure that only authorised personnel can access files within the system. As we also offer a cloud-based storage service, it means that all scanned financial documents can be saved within the cloud — protecting them from environmental disasters such as flooding and fires. Upon inquiry from an organisation, we send a member of our team along to assess the requirements of the business. This enables us to properly advise, discuss, and recommend document scanning solutions so that businesses can fully reap the benefits of document scanning and document management software. Once that the project has been agreed, in most cases, our dedicated drivers pick up all the files that are set for scanning. These vans are securely protected and are tracked so that clients are able to check and see their documents on route to or from our facilities. Upon arrival at Microform, we book every single file against an inventory to ensure that everything is in place. The documents are then prepared for scanning and are fed through our high-volume document scanners (which can scan up to 16,000 documents per hour), to the BS 10008:2008 Evidential weight and legal admissibility of electronic information standard. Every single scan then undergoes a rigorous quality assurance procedure. Once this has been completed, the scanned images are then indexed according to the wishes of the client before a second quality assurance procedure is undertaken. The batch is then securely handed to the client in a preferred method such as SFTP, Cloud Software, HDD, DVD or CD. Scanned documents can then be securely transported back to the client or confidentially shredded at our own facilities. My documents are confidential, will that affect scanning? No, up to 80 per cent of our work is private and confidential, so we enforce the strictest measures and processes to ensure the tightest possible controls. What kind of files can I receive? We can provide clients with a range of file types including PDFs, searchable PDFs, Microsoft Word and Excel documents, JPGs, and high-resolution TIFF images amongst others. Can I check my scans before I receive them? All our clients are offered previews of scans so that we can ensure complete satisfaction. From sign-off, the full batch are then delivered to clients, alongside the original documents (if required). 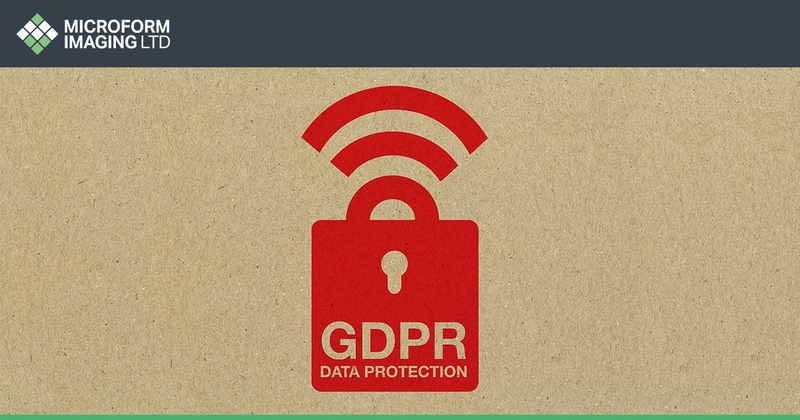 GDPR: What does it really mean?